The Classic Hybrid DVD Audio Disc (HDAD) is a two-sided DVD disc with 24/192 PCM data playable on DVD Audio players on one side, and 24/96 PCM data playable on DVD Video players on the other side. The Classic HDAD is a truly universal DVD disc playable on all DVD players. So if you have a DVD video player, you can play the DVD Video side of the HDAD - insert the disc with the Blue center ring facing up and enjoy 24/96 playback resolution. On a DVD Audio player, simply flip the disc over with the Red ring facing up and enjoy 24/192 playback resolution. This is the recording made famous by Harry Pearson of The Absolute Sound, who touted its lifelike qualities and the alluring vocals by Netania Davrath. 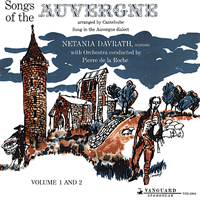 Davrath’s pure voice and interpretations evoke the sunlight and clear air of the French Auvergne region. Many reviewers champion her over singers with more renown. 9. Oi Ayai - Oh! Ah! I Didn't Know What I Was in For! This recording was purchased for a friend as a joke; I'm coming clean here. This was a gag gift and it turned out the joke was on me. This has to be one of the most fantastic recordings I've ever heard. These songs are spectacular and..., well, French, but you owe it to yourself to give it a listen. If you own state of the art equipment, you WILL BE BLOWN AWAY!